As we get older our muscles shrink causing surrounding fat and tissue to take on a drooping appearance. With exercise and the right diet we can generally keep our bodies in shape but the facial muscles are more difficult to exercise until now. When the facial muscles begin to shrink the drooping effect on the face can be very aging. By rebuilding the aging muscle mass to its previous state the face is fuller and benefits from a visible lift which can be retained with regular treatments. This full, healthier look also helps reduce the appearance of lines and wrinkles. The Genie Take Ten is a perfectly natural way to exercise facial muscles. 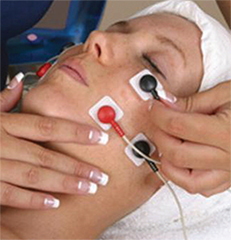 Because we are "power" building, a 10 minute treatment is sufficient to achieve all that is possible in one session. For 24 hours after a treatment the muscles are still working and regenerating themselves. Known as the personal trainer for the face. With the use of electrical muscle stimulation this treatment rebuilds the aging muscle mass to its previous state and benefits from a visible lift which is retained with regular treatments.